I tend to view holidays as simply a day off. These "made up" holidays, whether real or hijacked by the gifting companies are particularly easy to ignore. I don't need cards to be happy. I know I'm a mom and having my daughter talk to me, confide in me, laugh with me makes every day "Mother's Day". It used to be a measure of how much my friends thought about me if they remembered me on these holidays. Then I realized that the hecticness of life often means I can't send cards, let alone some of my friends. And I realized that one should never, ever measure a friendship by how many times you get a card in the mail. This also should extend to your family. My daughter loves me. I'm certain of that. If she can't get something in the mail for Mother's Day, it's not a measure of how little she thinks of me. It's because she's busy. When I arrived in Virginia, last month, she surprised me with a couple of gifts. The first is the suncatcher to the left. She said she saw it and it was me. Yeah. That is me. I need to wash the front window and then I can put this up. I kind of wish the girls would react this way, but I'm thrilled when they sleep together in the recliner, one on one side and one on the other. While this is beautiful, the other gift for Mother's Day was truly a work of art. 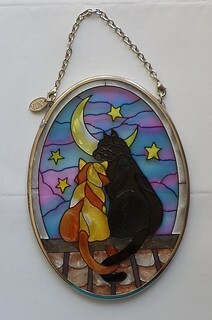 Carole has a friend, Cheal Snoke, who makes jewelry and Carole commissioned a piece for Mother's Day. This is beautiful. 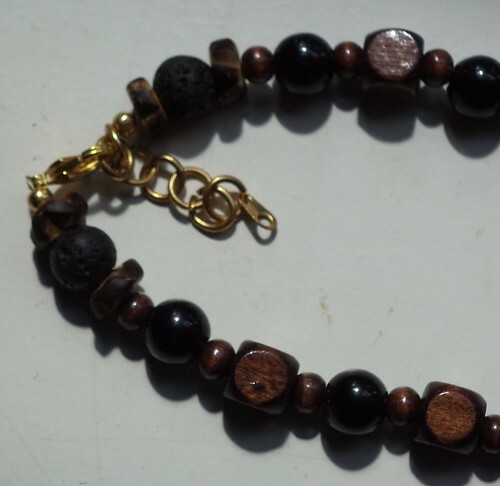 These are black and two shades of brown beads. 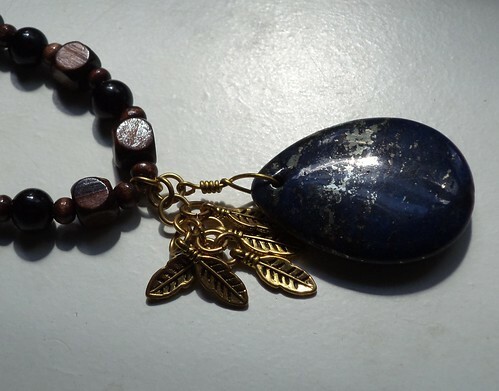 The pendant stone is navy blue with silver flecks. I love the feather accents. The clasp is great because it's not just one size. There are several links on this clasp so I can make it up to an inch longer if I desire. That is a huge plus for me. I wore it to a special event on Friday evening. 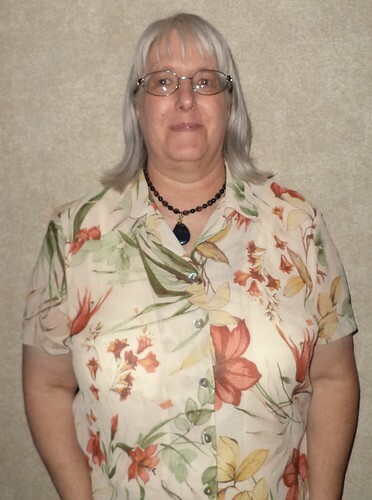 I generally don't post photos of myself here but here I am wearing the necklace. I need to build an outfit around this. I'm thinking cream with brown accents. Looking through my closet, I don't have much in that area. This has become a treasured piece and I want to show it off. My daughter has exquisite taste in jewelry and I'm thrilled to have been the recipient of a stunning necklace. Cheal has a Facebook page, Saturnine Treasures. Check out the photos for more examples of her work. I didn't drive to Virginia to receive a Mother's Day present of such beauty. This was just icing on the cake.